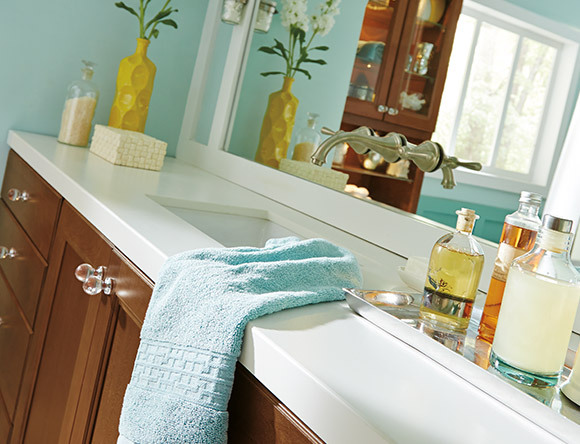 From daily hand-washing to washing off weekly face masks, a lot happens in your bathroom sink, so a well-functioning faucet could be the difference between a bathroom you love to use and one you want to avoid. As one of your bathroom’s most commonly used fixtures, your bathroom faucet will not only endure constant use on a daily basis, but also have to accommodate the style and aesthetic of your home. 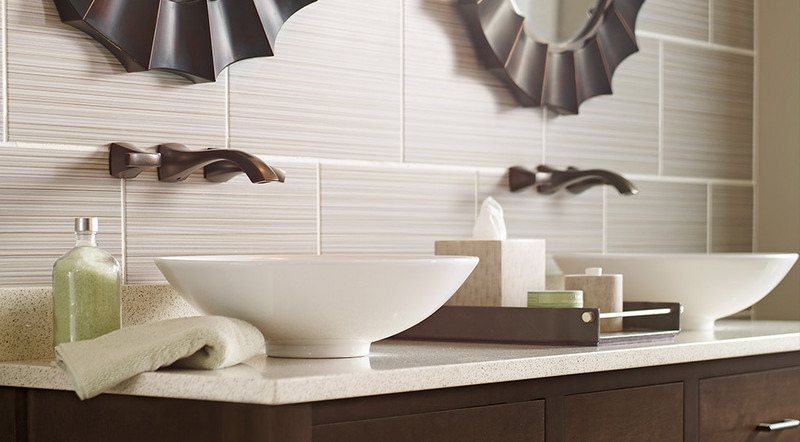 Whether you are completing a full bathroom remodel or a simple update, a new bathroom faucet is the perfect way to refresh or complete your space. With thousands of feature, style, and material options at Henry Kitchen & Bath, there are many important things to consider before selecting your bathroom faucet. 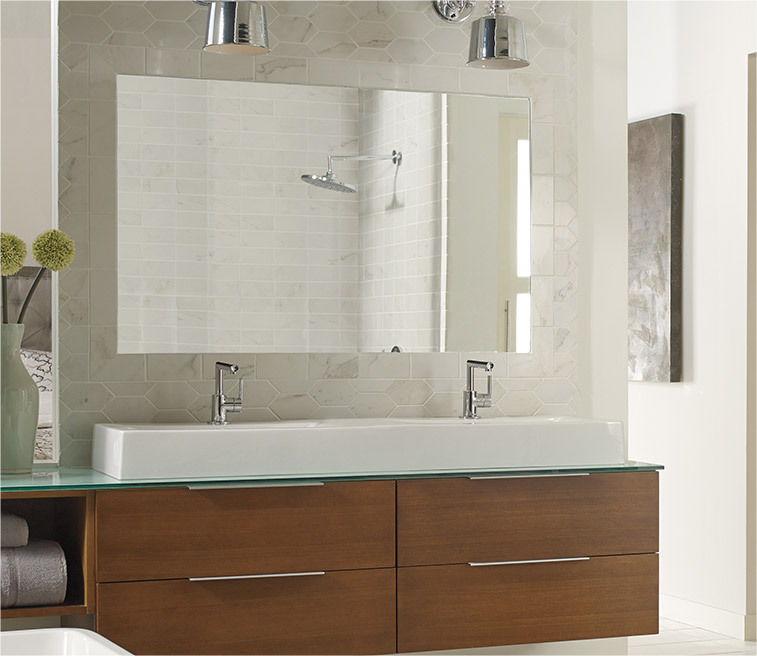 • When selecting your bathroom faucet, evaluate the amount of countertop space available for your new fixture. You should carefully measure out the area to determine not only what style of faucet will fit in the space, but also how far it should extend to ensure that your faucet’s water flow lands in the right location in your sink basin. In a large master bathroom, the additional counterspace on large double vanities allow for 3-piece faucets with wider spread handles. In smaller powder or guest bathrooms, a single-hole, center-set faucet is the perfect compromise between functionality and space conservation. A bathroom faucet that extends too far out will cause excessive splashing while a faucet that does not extend far enough may hinder daily usage. Determine the best style of faucet based upon the type of sink. 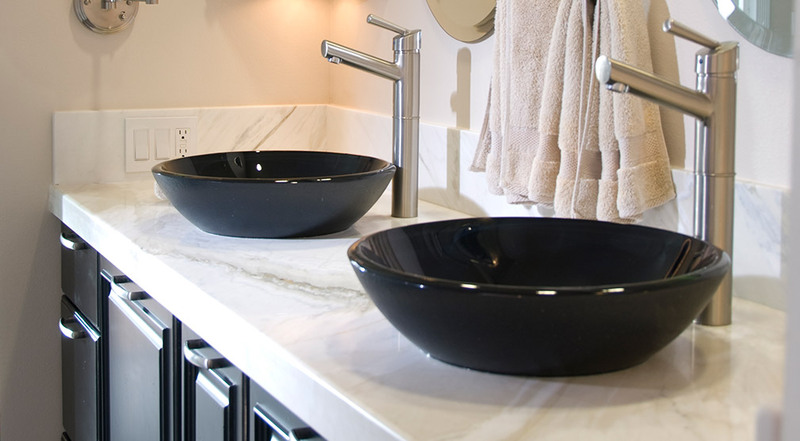 A vessel sink requires a taller faucet that reaches over the above-countertop bowl, while a smaller powder room sink needs a smaller faucet to prevent water splashing on you and/or your countertops. Once you have determined the best faucet size and type for your bathroom, you should choose a finish and style that best matches your design. With many colors, finishes, and features from which to choose, Henry Kitchen & Bath has the perfect bathroom sink for any bathroom - In a classic, Victorian bathroom, a polished, stainless-steel faucet complements the elegance and timelessness of the design, while a sleek, matte-black faucet is the perfect finishing touch in a sophisticated, modern bathroom. A high-quality bathroom faucet that not only functions perfectly but also matches your personal style is one of the best investments you can make for your family’s home and life. Henry Kitchen & Bath has thousands of bathroom faucets from industry leaders like California Faucets and Sigma, and our designers will work with you to find the best faucet for your space. 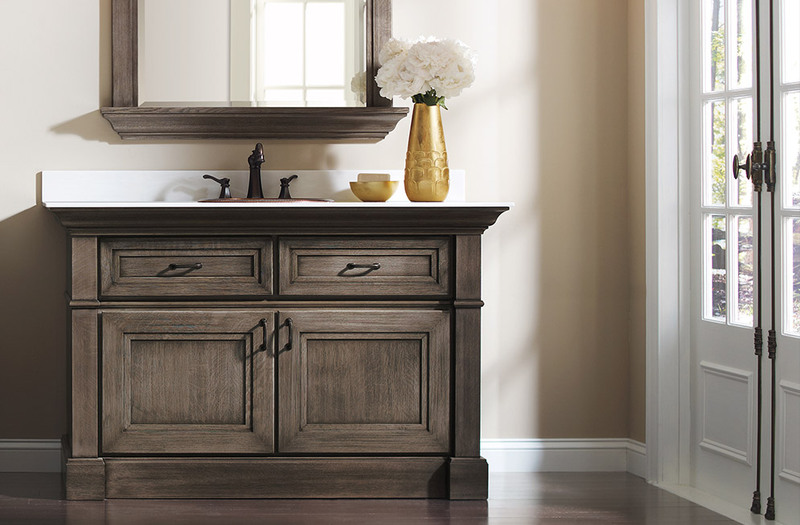 Whether you are remodeling a small powder room or completely renovating your master bath, Henry Kitchen & Bath has the perfect bathroom faucet for you. 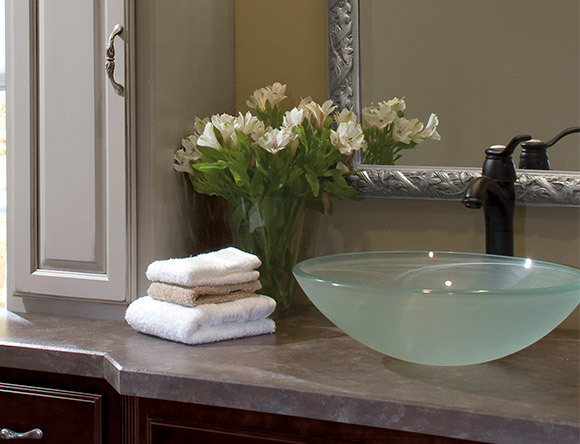 For larger sink areas, a widespread bathroom faucet offers a luxurious washing experience. These faucets include three separate pieces: two handles for hot and cold water placed on either side of the center spout. As their name implies, widespread faucets require more space than other bathroom faucet options, so be sure to have one of the expert installers at Henry Kitchen & Bath carefully measure your sink area to ensure you have the necessary room for a widespread fixture. 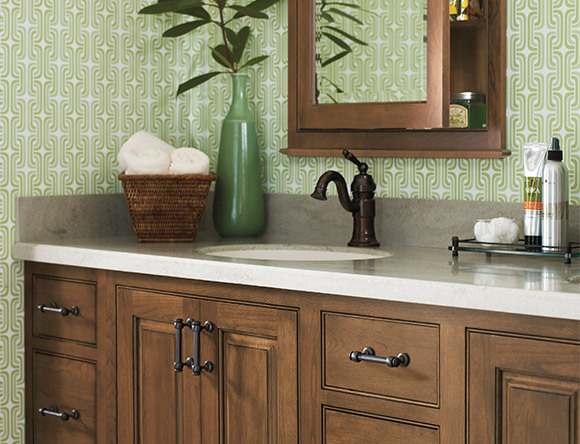 For vanities fitted for the standard three holes, a center-set bathroom faucet is a great option. Unlike the 3-piece widespread faucets, center-set faucets come in a single piece with the spout and two handles attached to a single base plate. Center-set faucets are the most popular bathroom faucet option because they allow for easy water temperature control, are the easiest faucet to install, and are typically the least expensive option. 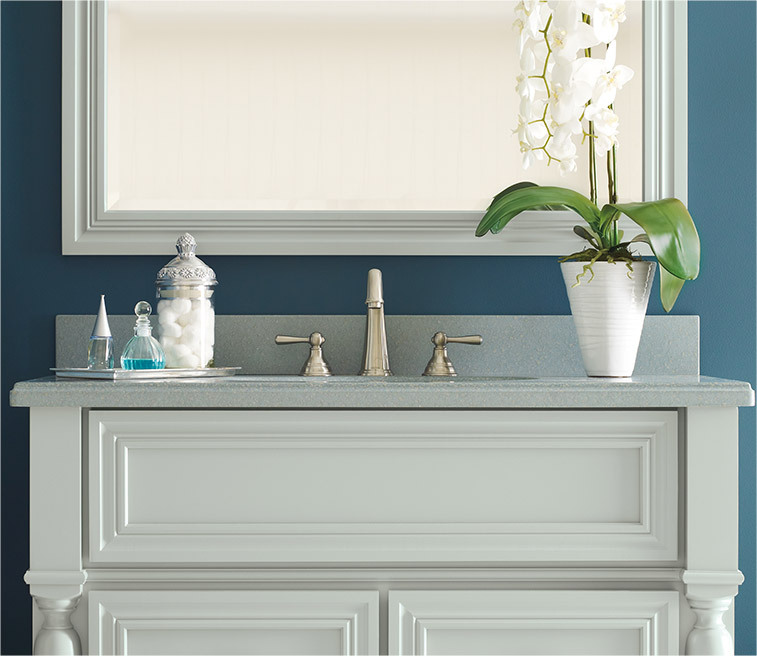 With thousands of material, finish, and style varieties, Henry Kitchen & Bath has the perfect center-set bathroom faucet for any bathroom remodel. For a luxurious, high-end experience, a wall-mounted bathroom faucet is the perfect fixture to transform your bathroom from a commonly used space into a relaxing oasis you look forward to using. Because wall-mounted faucets are elevated off the bathroom countertop, they not only free up counterspace in your bathroom but also make daily clean up quicker and easier. At Henry Kitchen & Bath, we have a wide selection of wall-mounted bathroom faucets from the industry’s leading brands, so you are sure to find the perfect fixture for your new bathroom. A vessel sink rests on top of the countertop, so a vessel faucet needs to be taller in order to comfortably reach over the added height of the exposed sink basin. While double handle faucets are standard in bathroom design, vessel faucets are typically single handle faucets with a high, curved neck for convenient handling and maximum function. When you consider how many times a day your family uses your faucet, it is easy to see why a selecting the perfect bathroom faucet is an extremely important decision in any bathroom remodel or renovation. At Henry Kitchen & Bath, our experienced designers will help you sort through the thousands of bathroom faucet options we offer to find the perfect one for your needs and style. With many advances in faucet design, hiring an experienced installer is the best way to ensure all of your faucet’s features are properly installed and function for years to come. 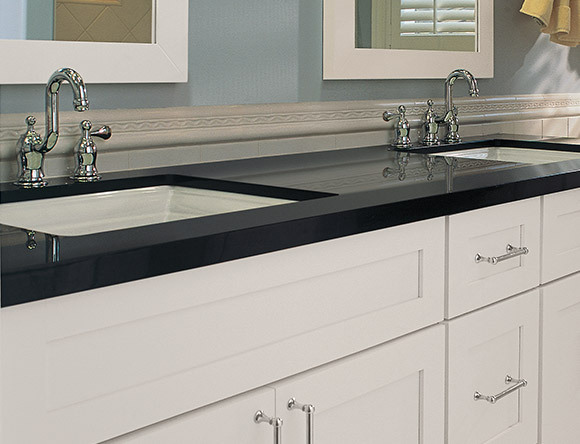 For you next bathroom remodeling or renovation, choose Henry Kitchen & Bath – We can make your vision a reality!